Weddings are a huge expense for everyone. As bride and groom show thanks to your guests by giving them a small token of your appreciation. 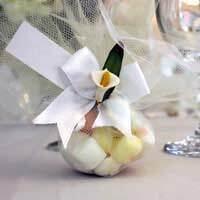 Here we give a rundown of some wedding favour ideas that will put a smile on everyone’s face. Wedding favours are not always given to guests. But think about the effort that they have made. Outfits have been purchased, gifts have been ordered, accommodation and travel tickets have been booked and all this adds up. The least that you can do, as the happy couple, is give them a small gift that they can take away with them at the end of the wedding. There are lots of wedding favours out there and some may well break your total budget. Here is a selection of ideas that you should be able to incorporate into your special day. If you have ordered a big wedding cake, make use of it and use it as the favour. All you have to do is buy some special cake boxes from a wedding specialist. Whilst your guests are enjoying the entertainment get busy behind the scenes and put individual slices into the boxes and lay them out on a table near the exit of the venue for guests to grab when they leave at the end of the night. Chocolates are commonly given as wedding favours. They can work out as an expensive gesture. Premium chocolate brands charge up to £5 or even more, per favour and if you have 100 guests, that price may soon outstrip your budget. A way round this is to devise your own. Bulk buy individually wrapped chocolate from a specialist chocolatier or supermarket and purchase some small boxes and yards of ribbon. Place a portion of the chocolate in each box and tie a strip of ribbon around the box, securing the lid shut. Finish with a neat bow at the top. More effort and legwork is involved in this option but the end result will be an economical yet impressive gift. If you want to give something slightly different, think about giving a candle to each guest. This is both budget friendly and unique. Buy the right amount of candles from a candle shop. They don’t have to be premium brands – a lightly scented candle of a decent size will do the job. Then get some gauze and cut it up into individual squares, large enough to house one candle. Secure the gauze around the candle with a ribbon in a complementary colour and repeat. As with the other favours, lay out on a table near the exit and pass to each guest as they leave the celebrations. If money is no object, splash out and let them indulge in a celebratory drink. A mini bottle of champagne will go down a treat and it’s easy to bring together. Or have two presentation options – simply place all individual bottles on the table and hand to guests as they leave, or wrap them up. Individual boxes or pieces of gauze tied around the bottle will add to the total cost but will enhance the overall presentation. As you can see anything goes when it comes to favours. You are only limited by your budget. Chocolates, wine, candles, beauty treats or individual roses are all viable options. Whatever you choose, the favour will be a fitting end to a fantastic day!